August 30, 2018 Industrial, Computing & Engineering Technologies, Students, Welding Comments are disabled after 182 days. The all-female team from Penn College that participated in a welding fabrication competition at the SkillsUSA National Championships, shows the rocket stove they built during the event. The stove will be donated to a family in the developing world by WaterStep. From left are Joelle E. Perelli, of Bath; Natalie J. Rhoades, of Weedville; and Erin M. Beaver, of Winfield. WaterStep, a Louisville nonprofit dedicated to enhancing access to safe water, teamed with SkillsUSA to earmark all the rocket stoves produced during the welding fabrication competition for international distribution. Rocket stoves are small, efficient and eco-friendly stoves used for individual cooking. The organization is working with its network of international partners to determine the most useful destination for the stoves and to coordinate the distribution. “Realizing that with my trade I can do something for others is a cool thing to think about. It gave me a separate sense of pride besides the competition,” Perelli said. The competition gave teams approximately six hours to build a rocket stove based on blueprints and materials provided on-site. 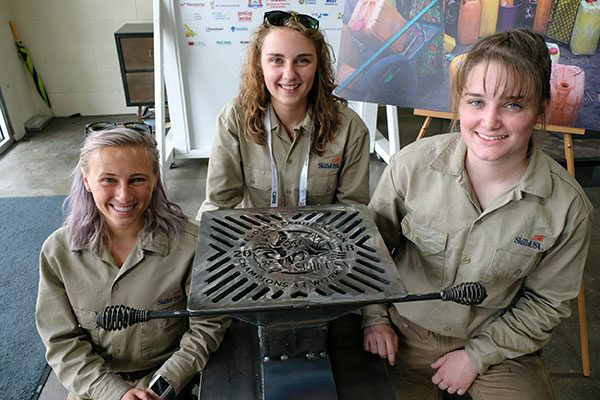 Penn College – the only all-female team competing in the event – finished seventh out of 23 entrants with their 31-inch-high stove made mostly of carbon steel. As the only all-female welding team, the Penn College trio received significant attention during the national championships, which showcased the nation’s best career and technical education students. They were interviewed by several outlets, including the WorldSkills podcast. The team qualified for nationals by winning district and state competitions. Beaver, Perelli and Rhoades (from left) learn about the mission of WaterStep from Kurtis Daniels, director of training and field operations for the nonprofit. WaterStep is donating the rocket stove made by the Penn College welders during the SkillsUSA National Championships to a family in the developing world. The team members believe they could have done better than seventh at nationals and admit that they were initially disappointed in the standings. But the true result of the competition makes them smile today. “Once we got to WaterStep and saw all the rocket stoves sitting on pallets and it was explained to us where they were going and how they were going to be used, it completely changed our perspective,” Perelli said. “You usually don’t have too many opportunities to help people far away. It was a small thing that we made, but it will impact a family more than we can imagine,” Beaver said. In addition to a bachelor’s degree in welding and fabrication engineering technology, Penn College offers associate degrees in welding technology and metal fabrication technology and a certificate in welding. This fall, the college plans to break ground on an approximately 30,000 square-foot expansion to its welding instructional facility. The expansion will enable the college to increase traditional fall semester welding enrollment by up to 60 students. For information about the welding program and other majors offered by the School of Industrial, Computing & Engineering Technologies, call 570-327-4520.